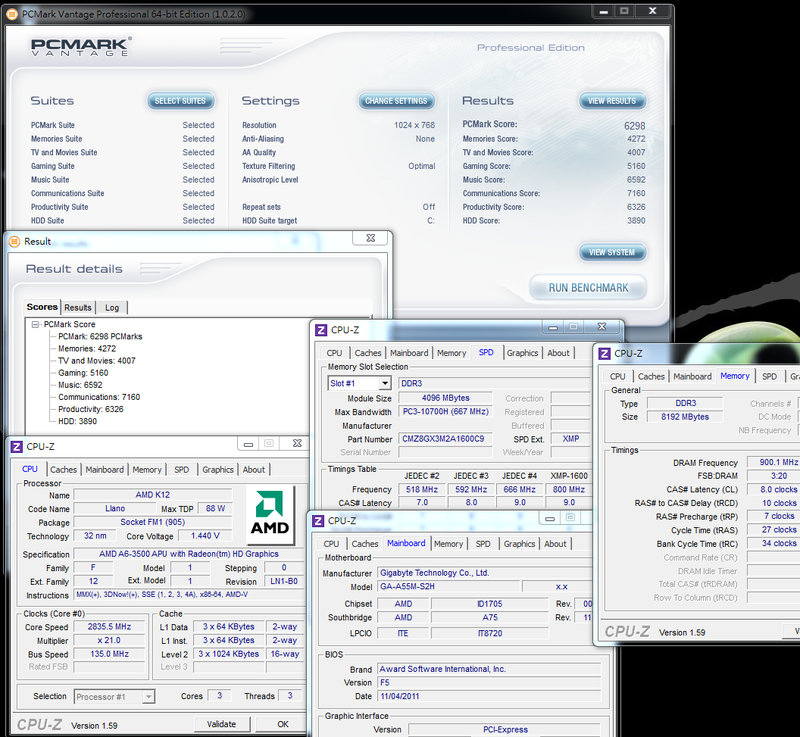 AMD launched new APU structure, FM1 platform in July 2011. 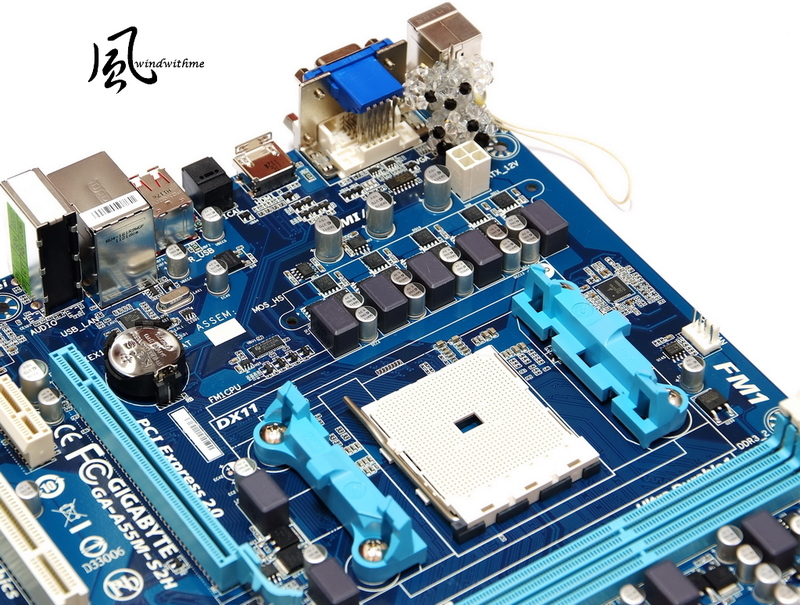 6 months passed, there are only A75 and A55 chipsets support FM1 platform. However, FM1 CPU is getting more and more. Mainly it’s for mid to low market. The C/P is quite well. FM1 has X4/6 series as 4 Cores or K series for OC market. The main strength for FM1 platform is 3D performance of APU structure. 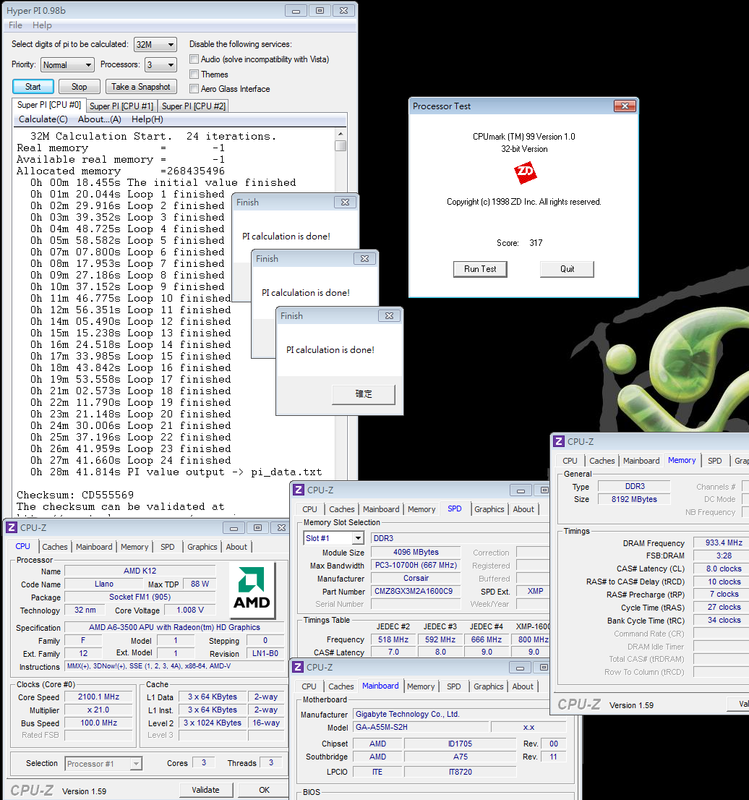 How to pick higher built-in 3D graphic and CPU performance is key subject for selecting APU. Even though it’s an entry level product, the balance between built-in 3D graphic and CPU performance is important. 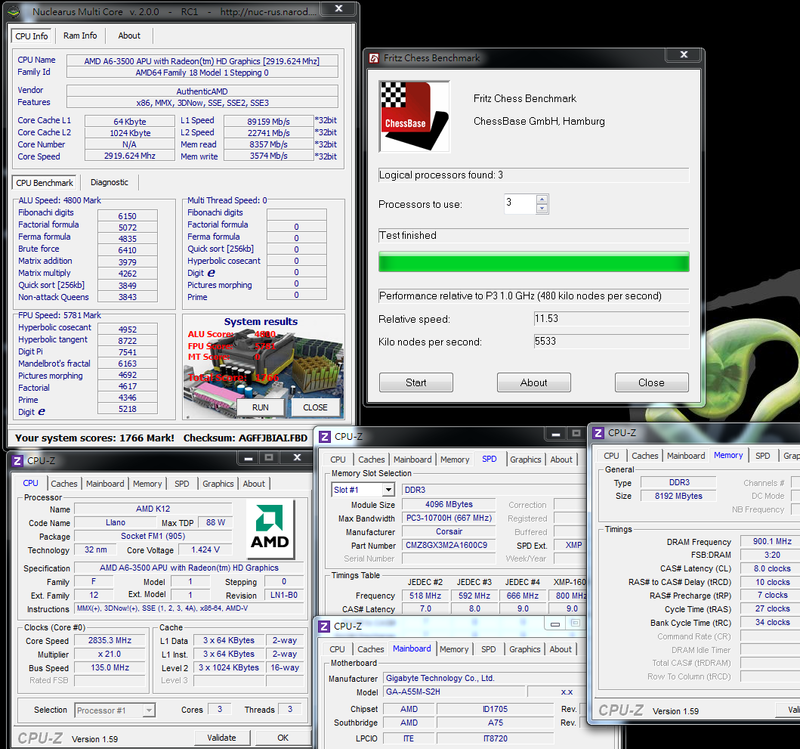 Finally, I decide to buy AMD A6-3500, triple cores, and AMD HD6530D. 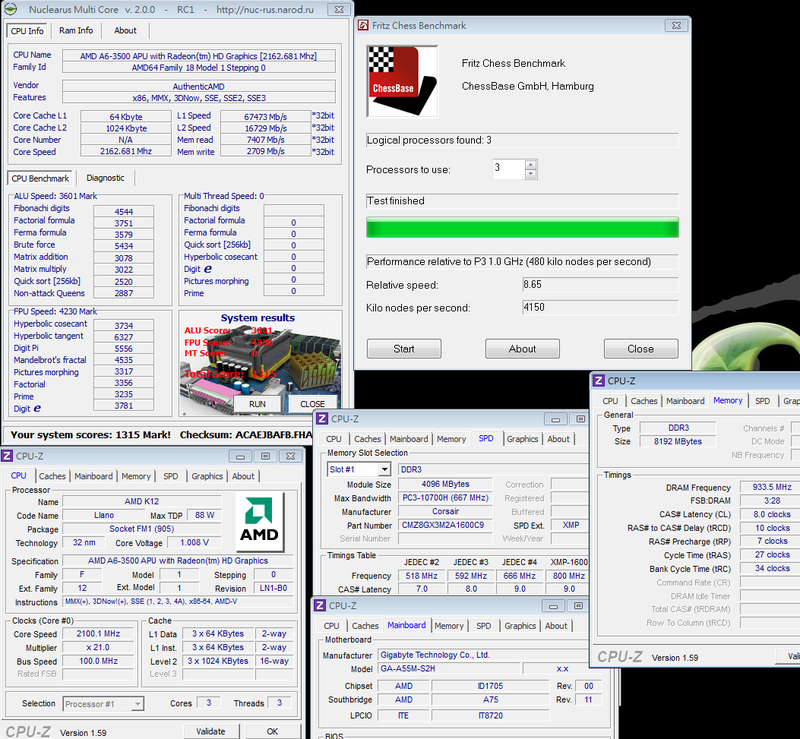 I didn’t buy most entry A4-3300, because it’s only dual cores and HD6410Dis lower spec. As using A6-3500, more CPU cores can compensate the performance and the 3D performance is higher. Product manual, sticker, cooler, and AMD A6-3500. FM1 CPU pins are complete different with AM3+. A55 chipset has no USB3.0 and SATA3 comparing to A75. For normal users or word process machine, A55 is enough. If you have more budget, you also can consider A75. 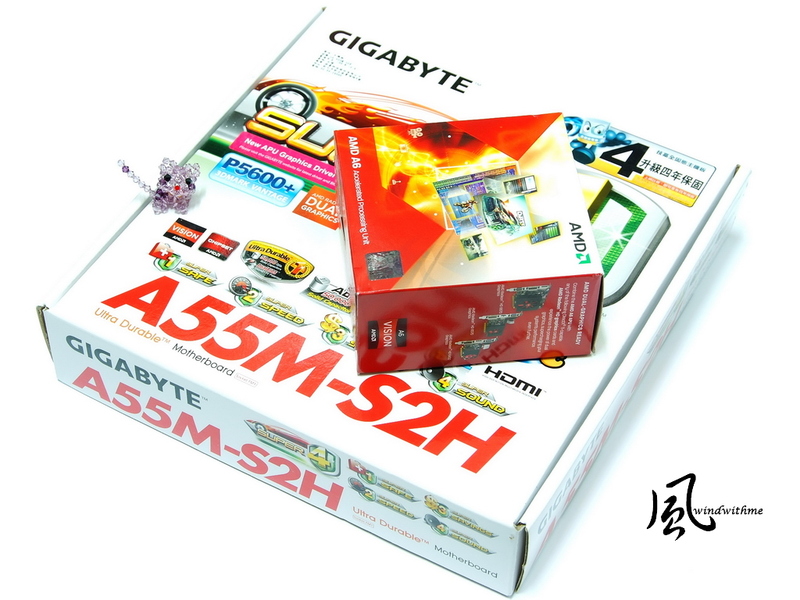 This review I use GIGABYTE A55M-S2H, the form factor is Micro ATX. All solid caps for entry MB is regular components now. 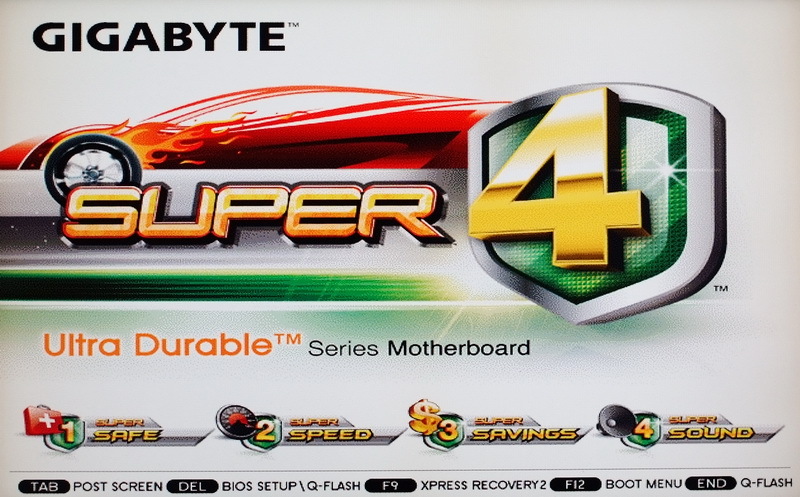 Also, it has GIGABYTE exclusive Super4 technology. Recently, it launched 4 years warrant which is conversed operation as 3C products is reducing their warranty. 2 X PCI-E X16, first is X16 and second is X4. It supports AMD Dual Graphics. 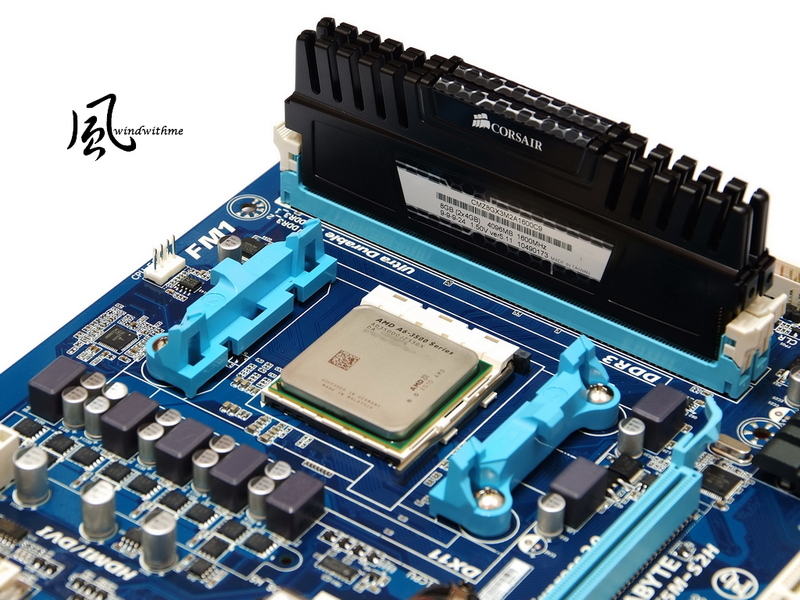 Realtek ALC889 Audio chip supports 7.1 channels and High Definition Audio. Realtek RTL8111E LAN chip and black connector is TPM module slot. 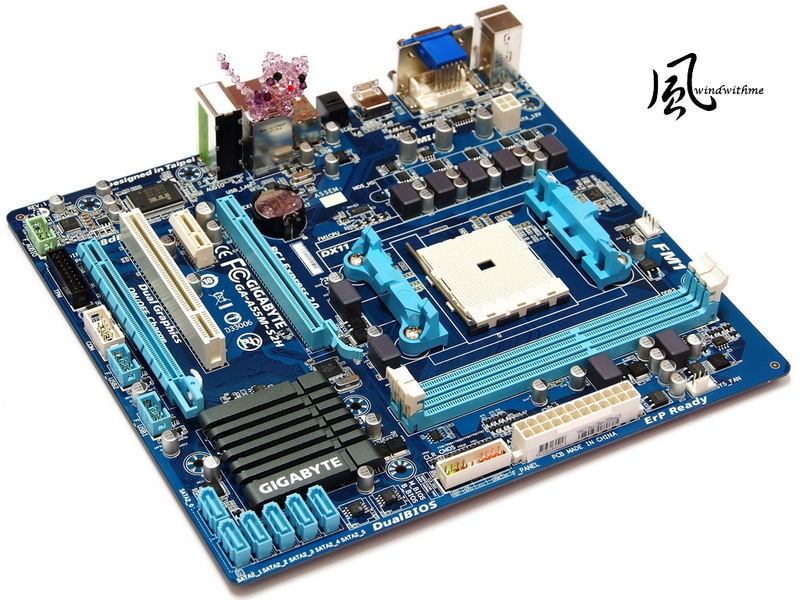 6 X Blue SATA, provided by A55. It’s SATA2 and supports RAID 0, RAID 1, RAID 10 and JBOD. There are two front USB 2.0 in left and right is DualBIOS. 2 X DIMM DDR3 support 1066/1333/1600/1866/2400(OC). DDR3 max capacity is 32GB. 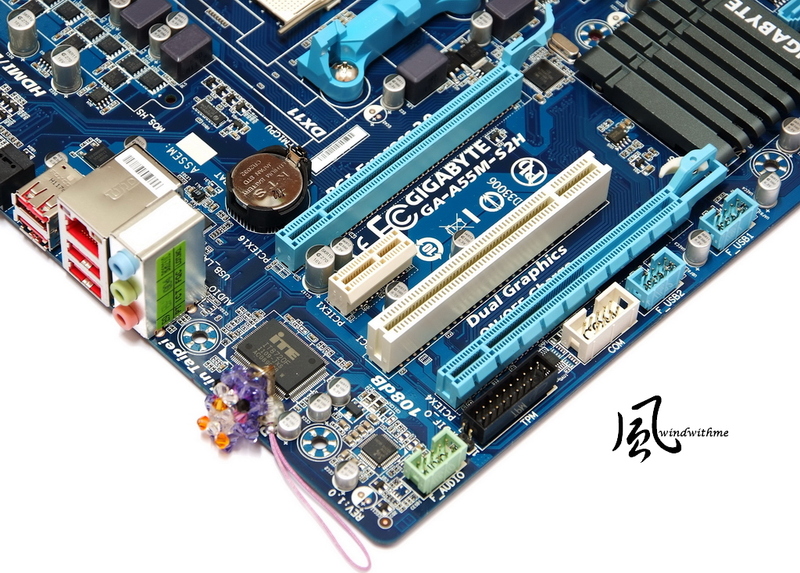 Next is 24-PIN power connector. 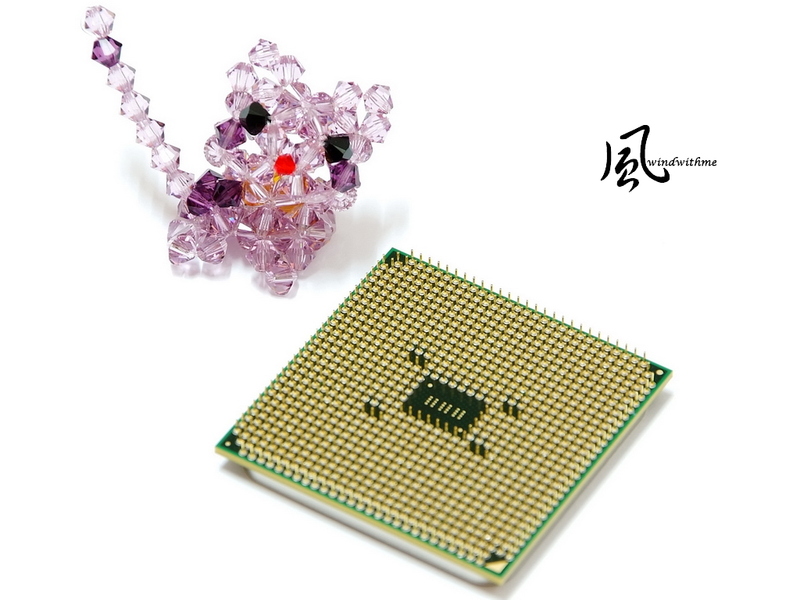 AMD CPU Socket FM1. It’s compatible with AM2/AM3 cooler. CPU uses 4+1 phases PWM. Upper left is 4Pin power in. Nuclearus Multi Core doesn’t support Multi Thread Speed. 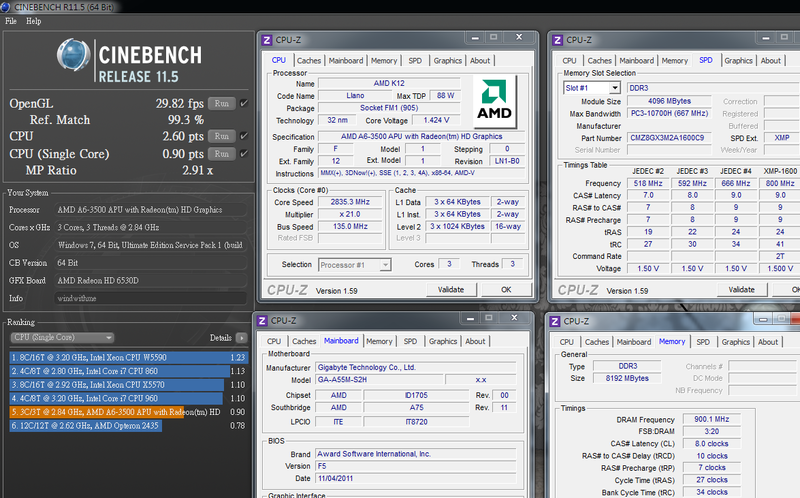 It should be having issue for AMD APU 3 Cores CPU only. 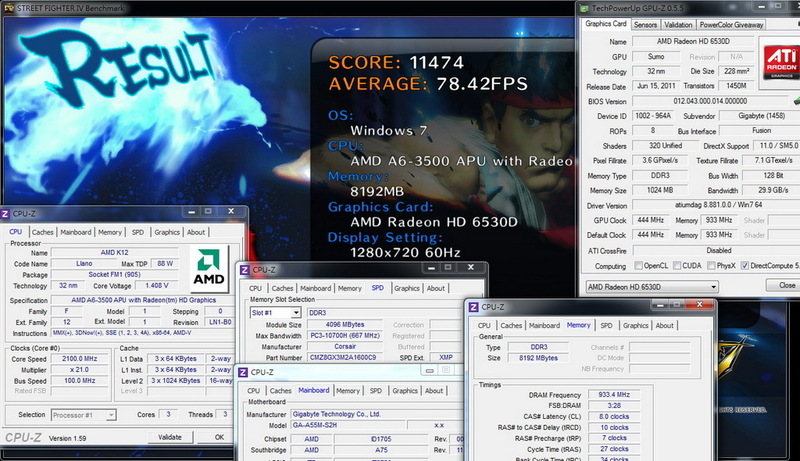 I will compare the performance with former Intel Pentium G620 and AMD A6-3500. G620 market price is lower than A6-3500 which is similar product position. 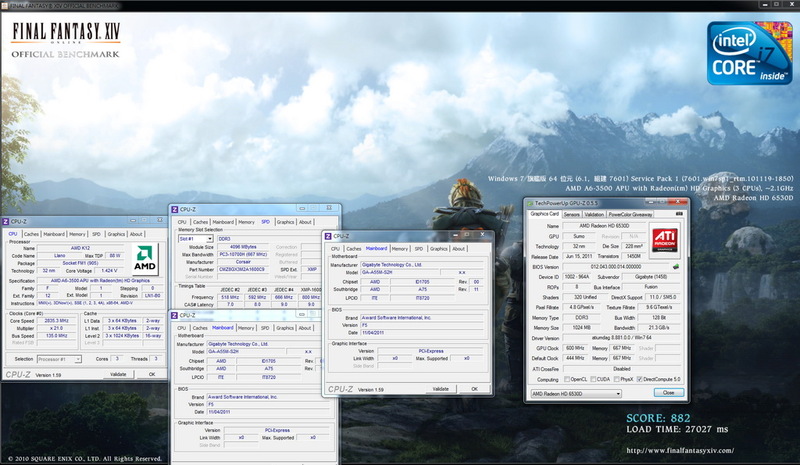 As CINEBENCH R11.5, in single thread performance, G620 is 55% higher than A6-3500. G620 dual core full speed is 3% faster than A6-3500 triple core. 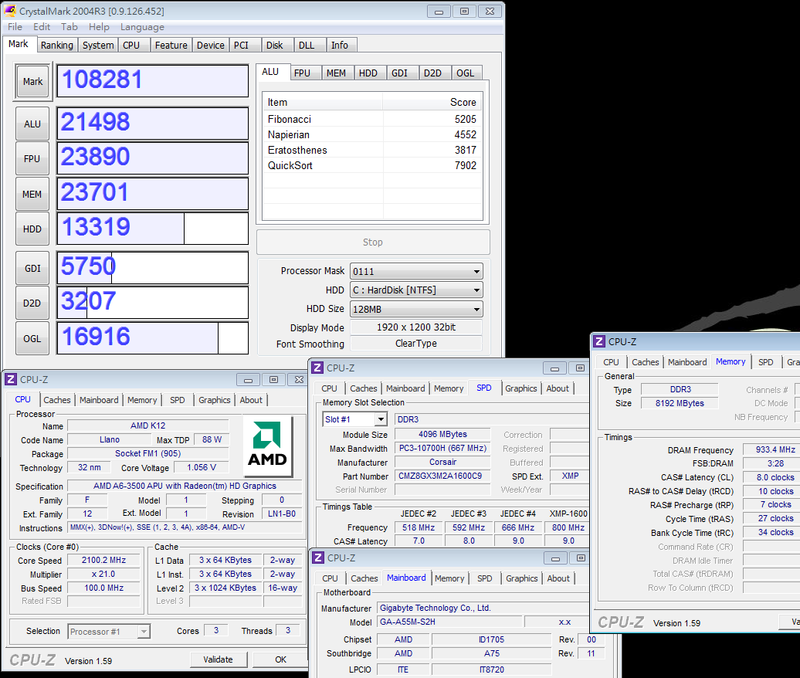 Fritz Chess Benchmark multi-tasking performance, G620 is 6% higher than A6-3500. A6-3500 is enough for general use. 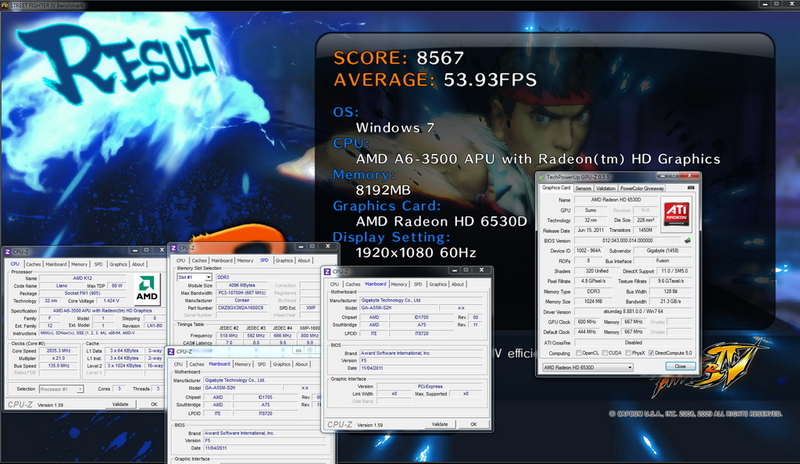 This is why I mentioned AMD multi cores can compensate the CPU performance. 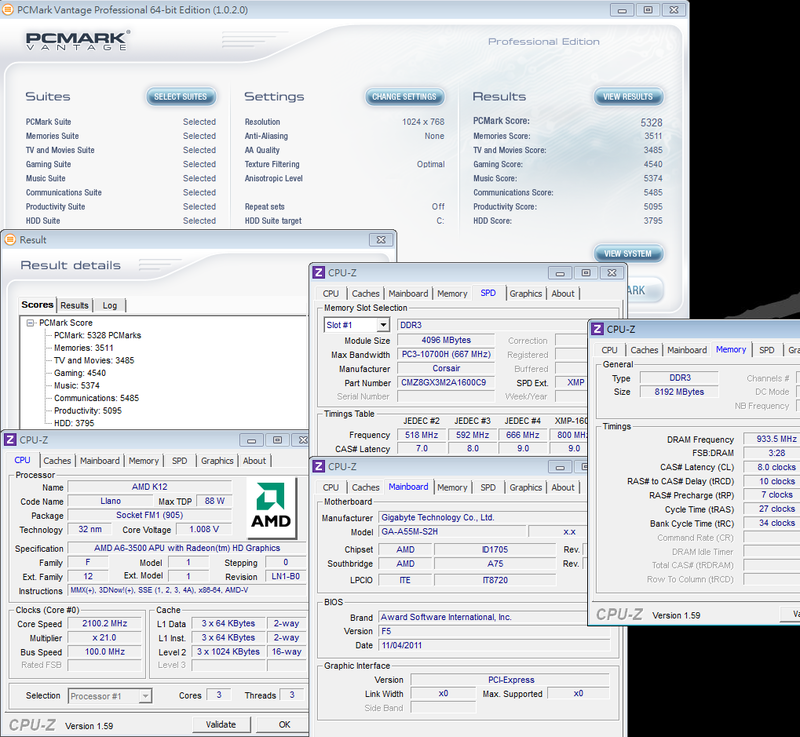 FM1 APU DDR3 can run 1866 as default and OC to higher range. The bandwidth is not improved much. 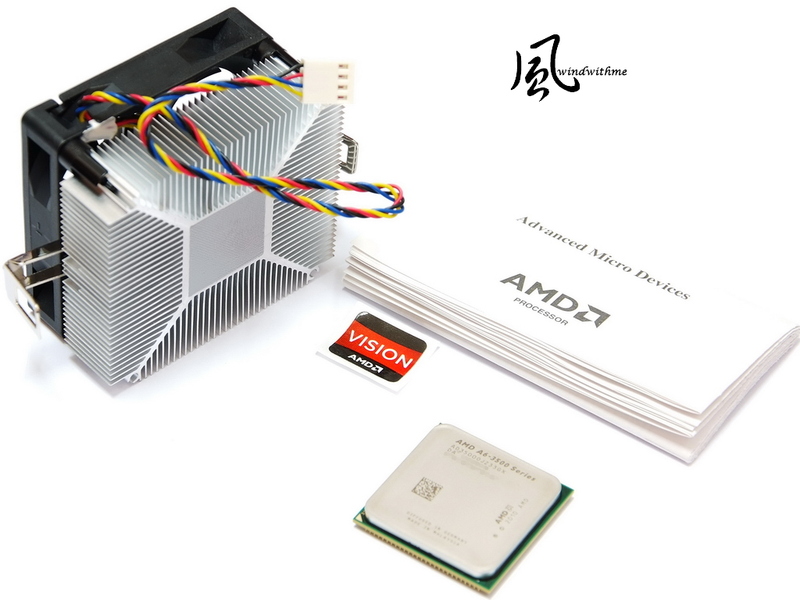 AMD AM3+ Bulldozer CPU is only AMD platform which improves the DDR3 bandwidth. About AMD 32nm CPU temperature, the test value will be much lower than actual temperature. Left side AISA64, you can see it’s much lower than room temperature. As internet data showed the CPU info is not accurate. 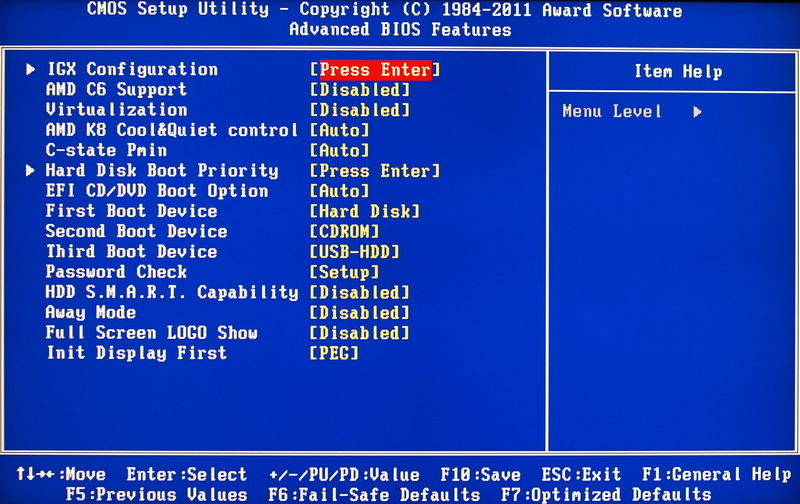 Even though GIGABYTE Touch BIOS software temperature is more accurate, it’s still lower than real temperature. 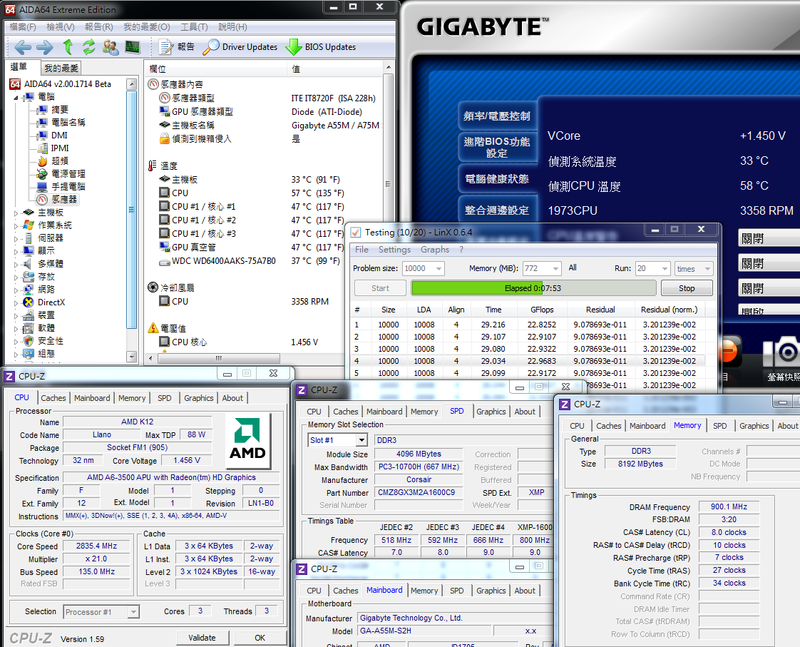 A6-3500 power consumption in entering to OS desktop is good, but full speed is a little higher in entry system. Built-in GPU is around 21W consumption. As good 3D performance, it’s still acceptable range. 3D performance is AMD APU advantage. Built-in 3D performance is higher level in APU. 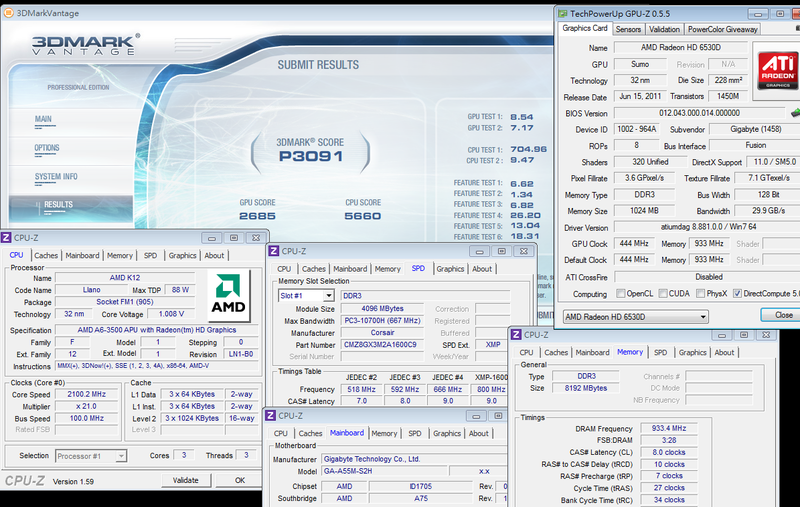 As three 3D software scores, A6-3500 3D performance is 2.4~2.5 times faster than Pentium G620. 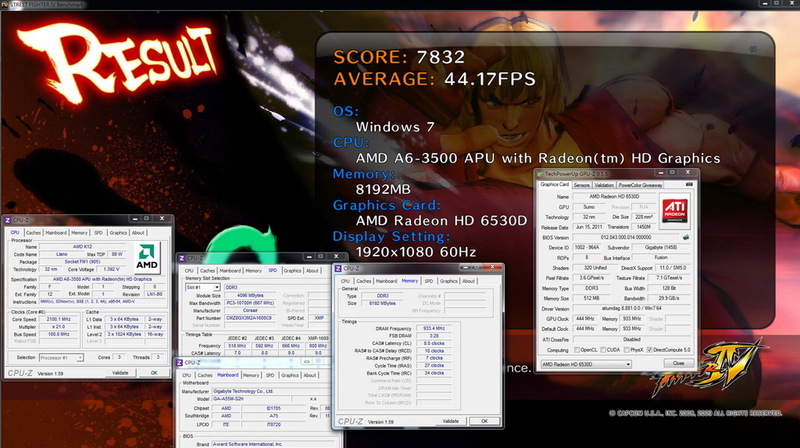 StreetFighter IV Benchmark, resolution 1920x1080, for UMA Frame Buffer Size comparing. 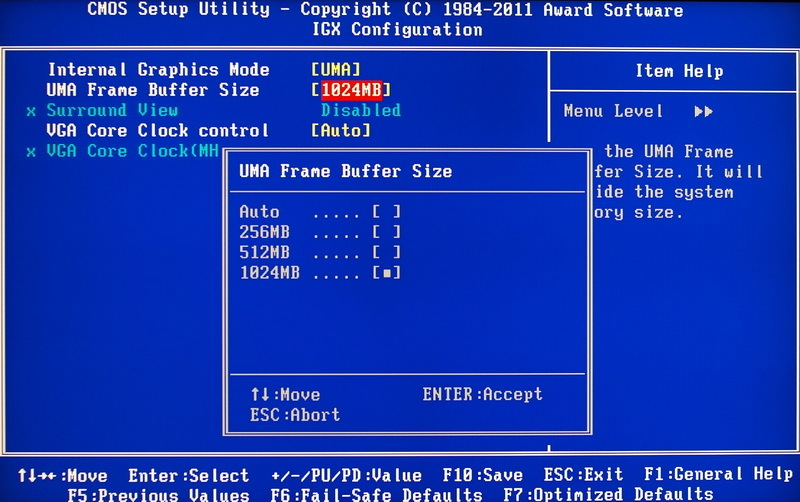 256MB and 12MB UMA Frame Buffer Size have less difference. 1GB also only has 1 FPS more. Actually, you can treat it as error. Some users would like to see the difference. 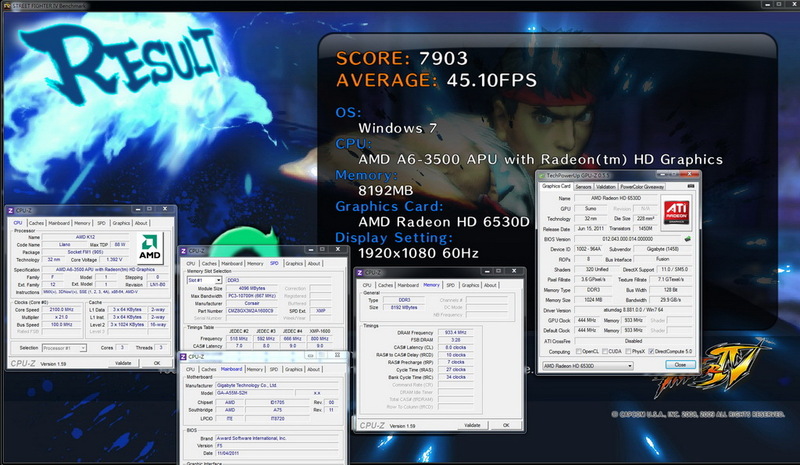 I add the DDR3 capacity test as reference. GPU Set Up Related Page. As former review, adjusting GPU clock is not improving 3D performance much. 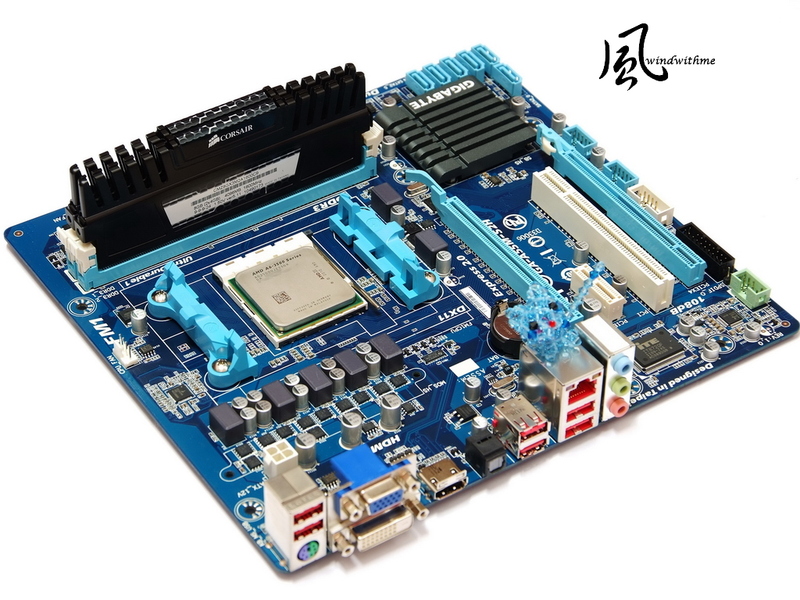 In APU platform, you only can rise DDR3 clock to improve 3D performance. This time I set it as CL8 10-7-27 1T. CPU Related Items. You can set up IGX here. 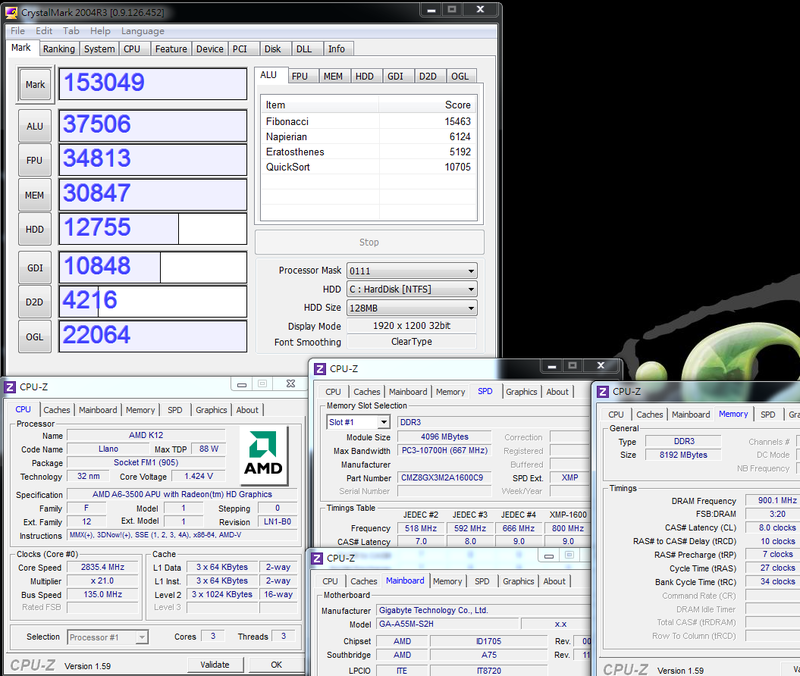 APU OC range is not as high as old platforms, however, the clock range is still wide enough. OC is relying on CPU and DDR3 quality to adjust clock and voltage. It takes to fine tune the best setup. 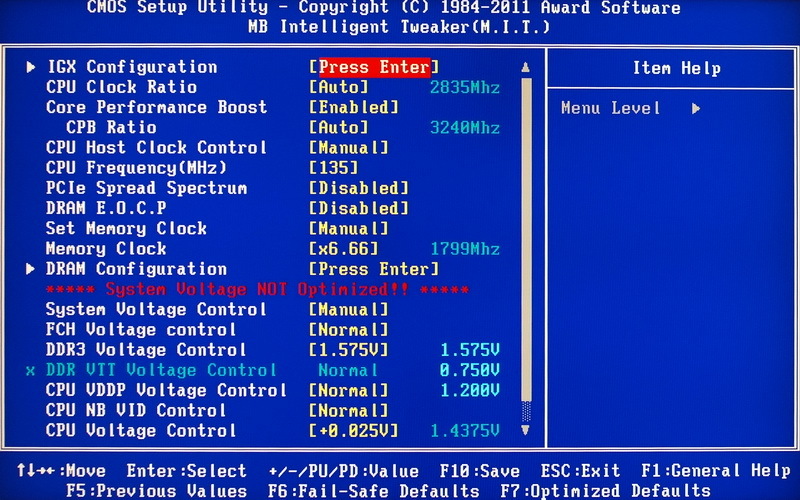 The comparison of A6-3500 OC from 100MHz to 135MHz. single threading improves 34~35%. 3-core full speed performance also enhances 33%. This is very well. 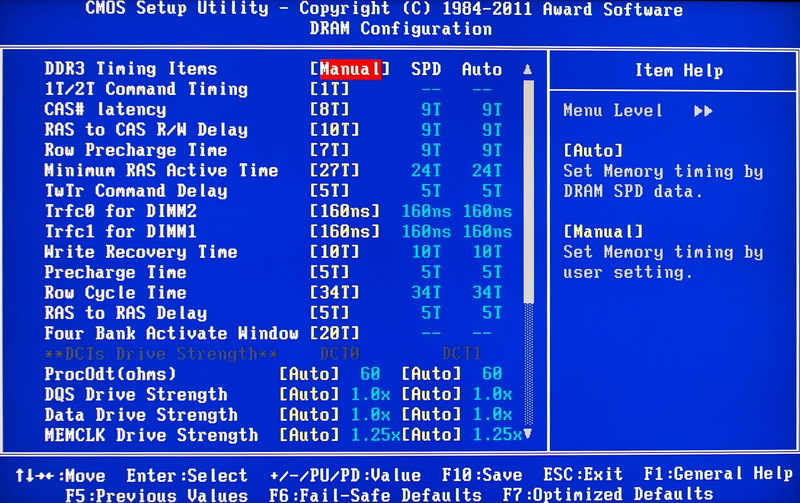 DDR3 clock compares to CPU default. 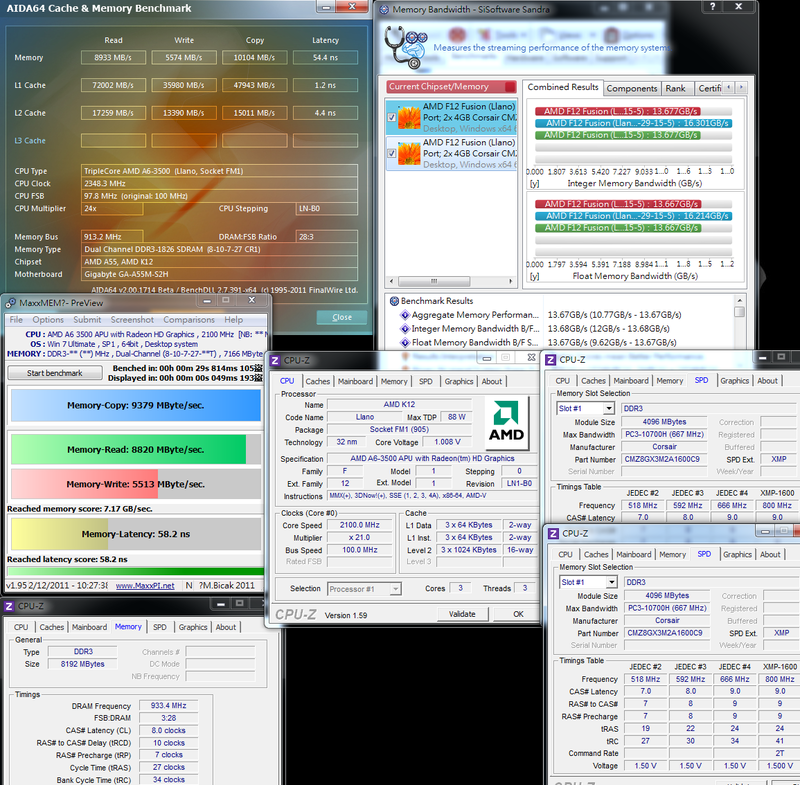 The difference is DDR3 1866 and DDR3 1800. 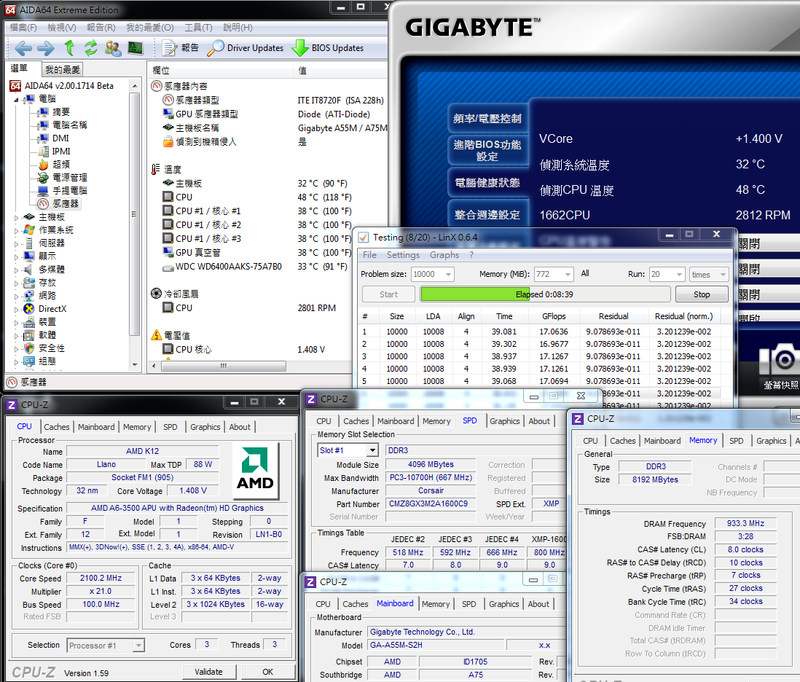 As CPU clock increasing, three DDR3 bandwidth benchmark all have 14~22% improvement. Even though APU DDR3 bandwidth is far behind his competitor, OC to increase DDR3 bandwidth is some help. Temperature in entering OS desktop is much lower and full speed is similar. 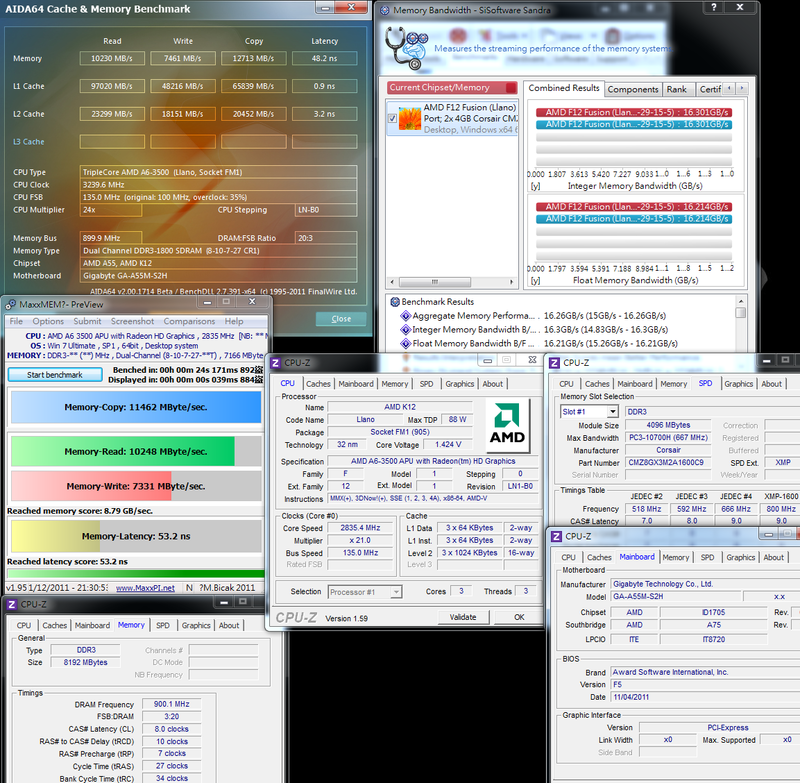 Do hope AMD 32nm APU or AM3+ CPU can improve the temperature report accuracy. 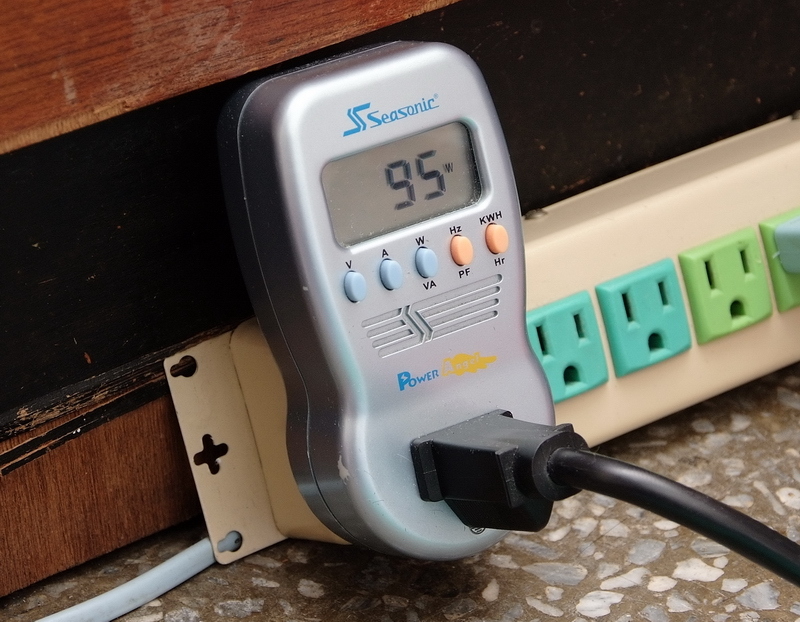 In full speed mode, you can feel the heat by touching the cooler. 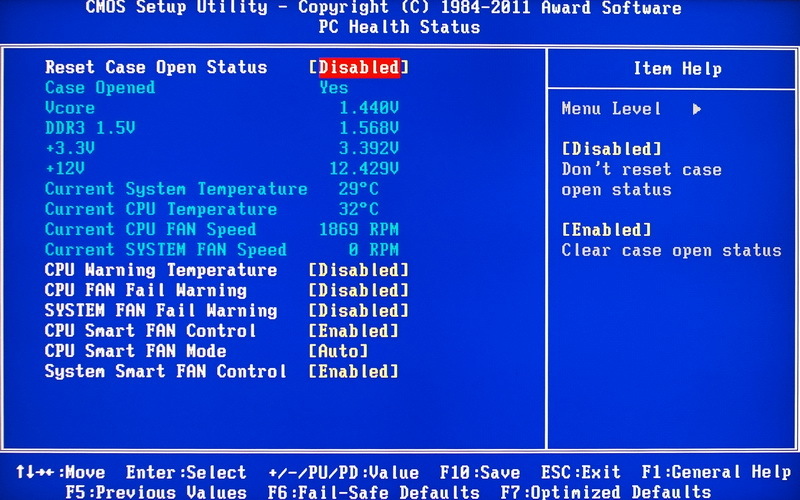 You need better cooling system for OC AMD APU. After OC, the power only increases 4W. In CPU or CPU/GPU full speed also increases 19 and 20W. This power consumption compares to A6-3500 performance is too high. I hope AMD can solve it by improving manufacturing. 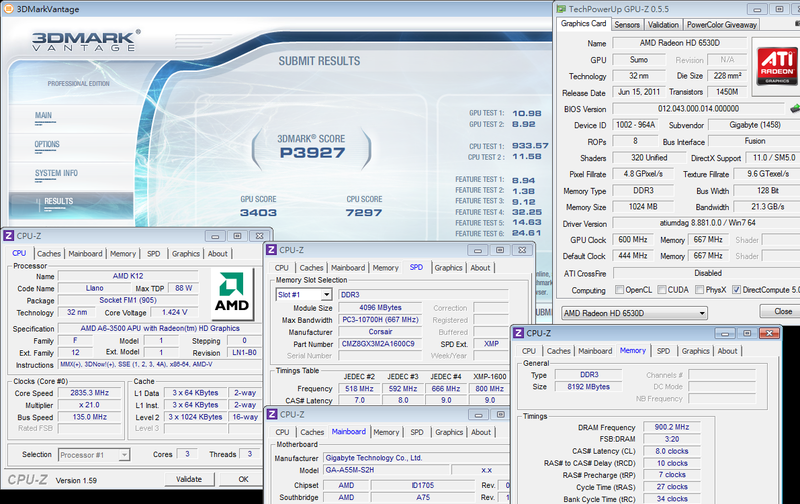 As CPU clock rising, Radeon HD6530D 3D also improves 24~27%. 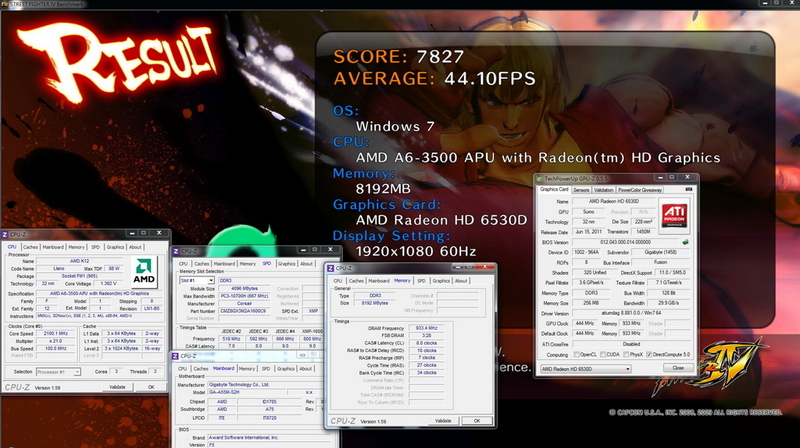 Even though it’ slower than A8-3850 Radeon HD6550D, the 3D performance is very impressive in IGP platform. This is key APU advantage. 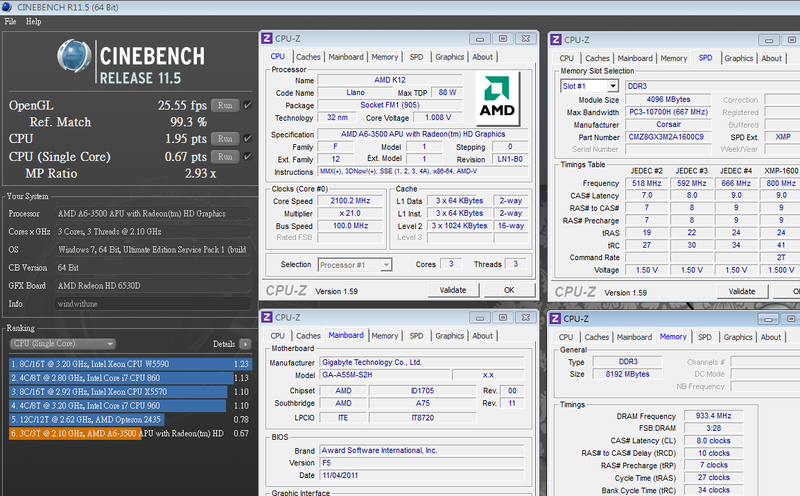 AMD FM1 CPU has three positions. First is entry platform by APU 3D performance. After then, it’s X4 CPU without IGP to build low cost 4 cores platform with A55 or A75 chipset. Finally, it’s K skus which is unlock version. Unfortunately, even K skus or 32nm manufacturing, CPU is hard to reach 3.6GHz in acceptable voltage. 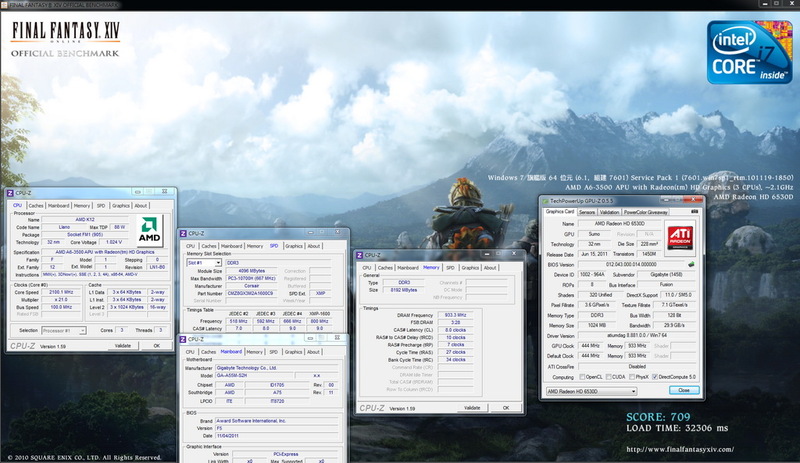 Formerly, windwithme already shared several A75 with A8-3850 reviews which are more high-end combo in FM1. 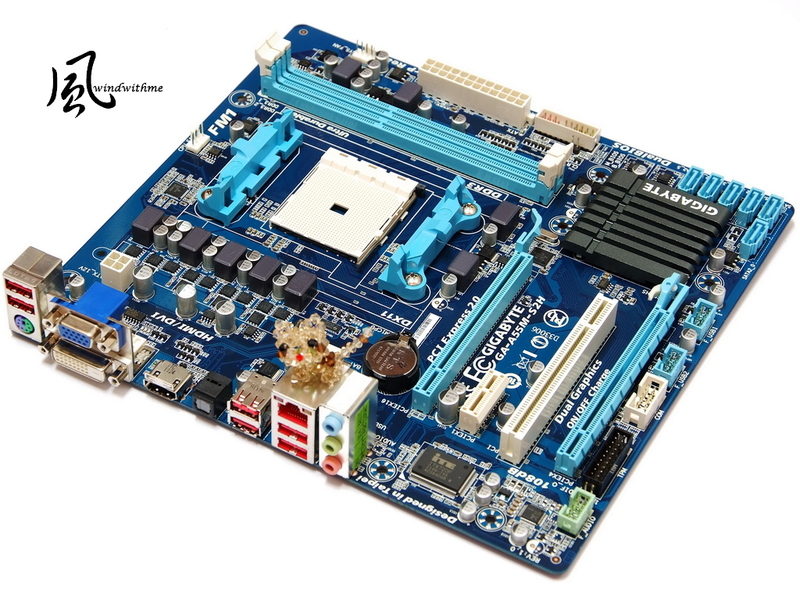 This review is entry A6-3500 and A55 chipset. 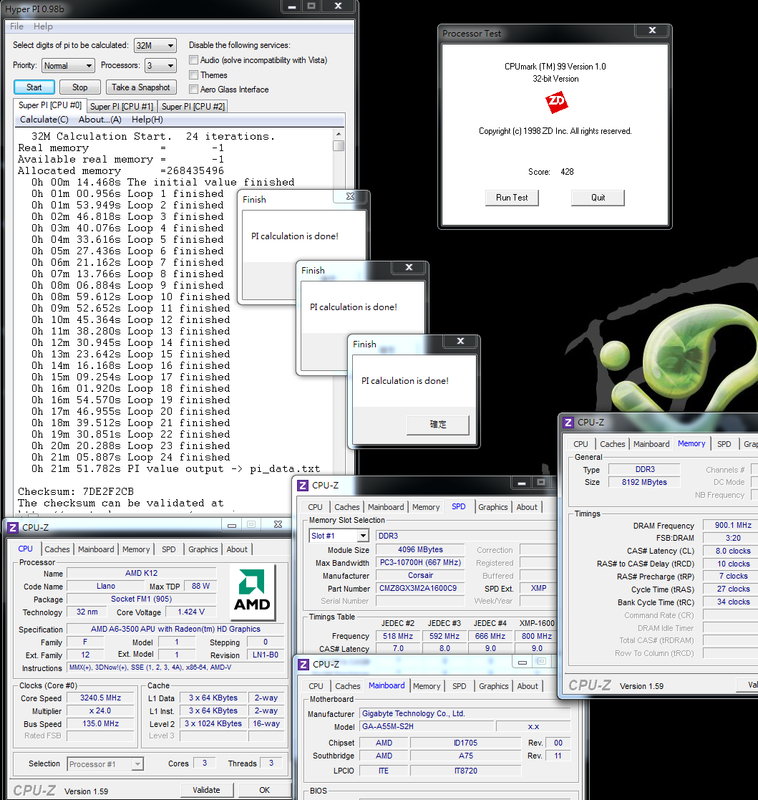 If you are looking for AMD APU, you can use it as your reference. APU owns good 3D performance and moderate OC ability. 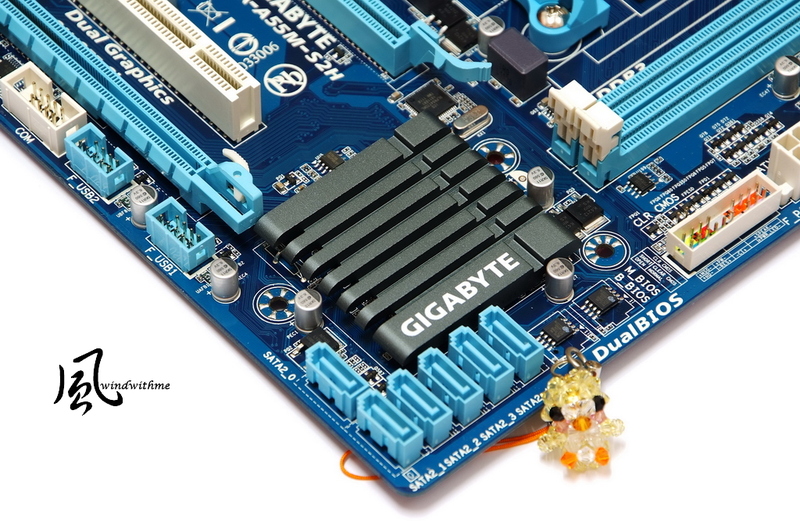 If you need high-end 3D applications, you better to have external VGA card. For only using IGP and need better 3D performance users, PU structure can be your good options. This article is also post in my blog WIND3C, Welcome your comments. my processor is also an a6-3500. Nice review wind withme. Keep them coming.